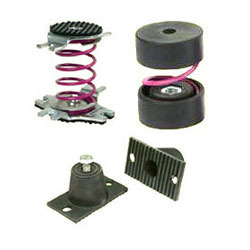 We are a leading Exporter of spring isolators and steel spring isolators from Coimbatore, India. 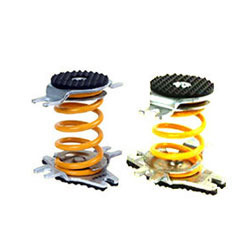 We are the leading manufacturers and exporters of Spring Isolators. We manufacture a wide range of spring isolators that are applicable in various industries and are appreciated for their excellent performance and durability. Fabricated using qualitative raw material, these spring isolators (anti vibration mounts) are offered at competitive prices. We are the leading Manufacturers and Exporters of Industrial components and Steel Spring Isolators. We provide an assortment of spring isolators that comprise springs made of steel en45 and the surface of the isolator is protected by cataphoretic treatment. M8 sleeves and disks enable the spring to be locked with the plates. We can customize our range of spring isolators to suit the specific needs of our clients.